With 2013 just begun, we have a solid 365 (well, technically 362) days to test-drive any and all new, emerging trends to our heart’s content. And thePantone Color Of The Year, emerald green, is no exception. While the hue calls to mind cheery clovers and traditional tartan prints, arguably, it can be a crapshoot. Do you really want to don such a rich green shade immediately following the holiday season? Will we look like we’re about two months too early on the St. Patty’s Day festivities? We say, not at all. A rich jewel tone, emerald can be flattering for just about everyone regardless of skin tone, hair color, and most importantly, your personal style POV. To prove it, we’ve pieced together five killer ensembles that seamlessly translate the luxurious shade for your aesthetic in a way that will feel totally you (or you, or you). The Ultra Femme — Feminine shapes, animal prints, and sweet embellishments are right up your alley. But with few shimmery emerald add-ons, you can give your look a little extra luxe appeal and remain as flirty as ever. Modstrom Cardigan Tille Leopard, $105, available at We Like Fashion; Couture Candy Elegantly Waisted Glitter Double Buckle Belt, $113, available at Couture Candy; Zara Studded Heel Ballerina, $15.99 available at Zara; H&M Blouse, $32, available at H&M; Shourouk DS Emerald Earrings, $519, available at CULTSTATUS; MSGMMetallic Green Skater Skirt, $239.25, available at MyWardrobe. The Prep — You may prefer to stick to the classic pieces in your closet, like your trench, your skinnies, or your loafers, but a simple standout piece in a bold emerald allows you to incorporate the color trend without straying too far from your foolproof chic style. And, really, why should you? 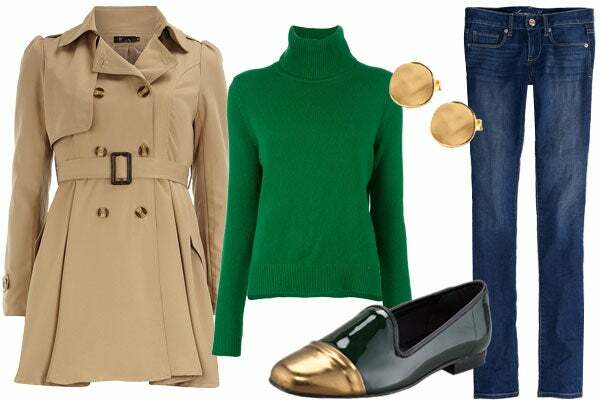 Dorothy Perkins Khaki Trench, $89, available at Dorothy Perkins; Allude Turtleneck Jumper, $360.44, available at Farfetch; Bettye Muller Premier Metallic Cap Toe Patent Leather Smoking Slipper, $150, available at Neiman Marcus; Gorjana Chloe Stud Earring, $35, available at Piperlime; AE Skinny Jeans, $29.99, available at American Eagle. The It Girl — You’re not just about trying one trend. You love them all, and you know how to mix them in a way that’s cohesive and inspired. When dissected, there are tons of trends transpiring in this one look — monochrome, statement necklaces, printed pants, layering — yet somehow the final product is even greater than the sum of its parts. Antik Batik Marina Crinkled Cotton Shirt, $94, available at The Outnet; Cole Haan Jen and Oli Chelsea Collection Ankle Boot, $548, available at Cole Haan; Gerard Yosca Emerald and Blue 8 Drop Necklace, $343, available at Charm & Chain; Uniqlo Women’s Cashmere V Neck Sweater, $39.90, available at Uniqlo;J.Crew Cafe Animal Jacquard Capri Pant, $198, available at Net-A-Porter. The Tomboy — Skip the fluff and frills. 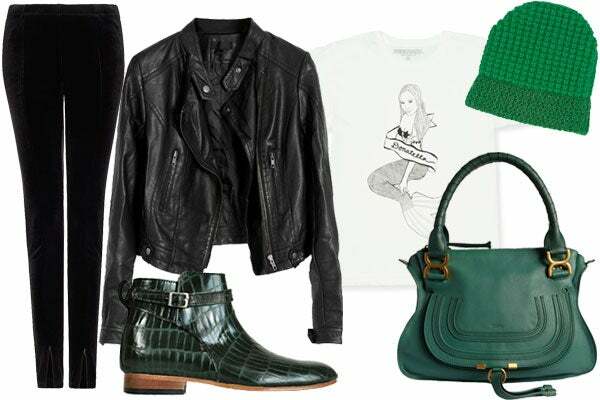 The coolest way to add in this shade of green is with sleek, croc boots that you’re bound to wear all the time. If you’re feeling even more adventurous, add a solid-colored handbag and beanie that will become just as go-to as your black-pants-and-relaxed-tee mix. Mango Frontal Zip Velvet Leggings, $29.99, available at Mango; Chicnova Motorcycle Jacket in PU Leather, $63, available at Chicnova; Dieppa Restrepo Emerald Croc Mer Boot, $352, available at Bona Drag; Deer Dana Donatella Tee, $60, available at Opening Ceremony; Reiss Annie Beanie, $37, available at Reiss;Chloé Marcie Medium Satchel, $1,795, available at Barneys. The Life Of The Party — Quite the antithesis of the laid-back tomboy, you’re not just going to wear the Pantone Color Of The Year — you’re going to make an entrance. And a super-sparkly frock is the best way to do it. Just add a more muted emerald clutch, dance-floor ready pumps, and a few party accessories, and you’ll be set all night. French Connection Simply Divine Coat, $298, available at French Connection; Alice + Olivia Beaded Dress, $441, available at Tessabit; Delvaux Vintage Clutch Bag, $598, available at Farfetch; Vince Camuto Kain Pump, $98, available at Shoebox; Juliet & Company Chandelier Sallu Earrings, $32, available at Juliet & Company.